School is almost here and I am looking for you. Are you outgoing? Fun? Stylish? Love to be in front of the camera? Then let's work together! 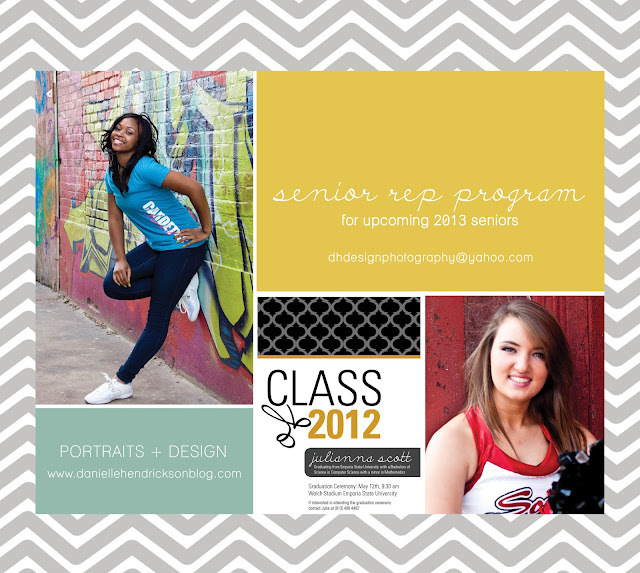 I'm seeking upcoming 2013 Senior graduates to be a part of my brand new Senior Rep program. I will be offering some awesome discounts and incentives if you're chosen to represent Danielle Hendrickson Design & Photography. Interested? A limited number of seniors can represent a school. If this is something that you would be interested in, email me at dhdesignphotography@yahoo.com by Aug 1st so we can set up your appointment date before Sept. 3, 2012.